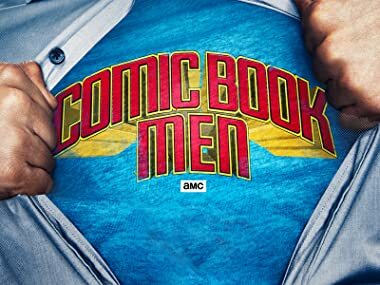 Comic Book Men returns for a third season. Kevin Smith and the Secret Stash Staff are back - Ruder, Geekier, Epic-er. Lou Ferrigno visits the Stash to give Bryan a lesson in fitness. A customer wants to buy a key comic by legendary artist and writer, Frank Miller. Walt and the guys get invited to an actual bat cave. A customer wants to sell his collection of original Star Wars action figures. The guys ask artist George Perez to help rebuild Mike's destroyed collection. A customer sells his set of vintage interactive comic books. Ming's interest is piqued when he has a chance to buy an oversized toy from the '80s. A customer needs help taking his wife out on the perfect date. The boys at the Stash try to strike it big bidding on derelict storage units. Walt geeks out with a fellow Elfquest fanatic. The guys head to the Baltimore Comic Con to launch their comic book, Cryptozoic Man. Meanwhile, Sunday Jeff works on a Saturday to fill in for Walt. A customer buys a gift for his dad's 75th birthday, which reminds Walt that Superman is also 75. The Stash throws a party, inviting a special guest. Nichelle Nichols pays the Stash a visit, looking for an Uhura Mego doll from the '70s. An X-Men fan buys the first appearance of the Phoenix. Walt's recent purchase of a Batman bowling ball inspires him to make a bowling team. An ill-conceived action figure makes its way to the Stash. A bored Walt decides to quiz the guys on comic book trivia, where a wrong answer lands them a gumball. A customer sells his Hellboy prop replica. The Stash helps auction off the work of legendary comic book inker, Mike Esposito. Walt buys the epitome of cool in the form of a paper doll. The guys have a chance to purchase a replica of the '66 Batcycle. A customer sells his collection of Marvel fan magazines from the '70s. A college hopeful goes to the Stash to appraise his collection and learns the value of comic book grading. Walt buys Wayne Gretzky memorabilia. Jason Mewes invites the guys to a Renaissance fair for medieval revelry. A customer brings in one of the most valuable items the Stash has ever seen.